View and transfer files across almost any cloud or on-premises storage system with a single interface. Drag and drop large files and folders to send or share data with any authorized individual or group of users. Deliver packages of files to recipients anywhere. Include external users in package delivery and content-submission requests. Migrate massive volumes of unstructured data at high speed across all market-leading cloud platforms. Use published IBM Aspera® APIs to extend existing web and mobile applications to include fast file transfer. Move files across on-premises and multicloud environments with an easy-to-use interface that simplifies file uploads, downloads, sharing and distribution. Easily drag and drop files and folders to transfer to any storage location. Assemble files into a digital package, and use an email-like interface to send to one or more recipients. Organize your files and users into secure collaboration workspaces. Enable users to submit data to a shared content-submission portal. 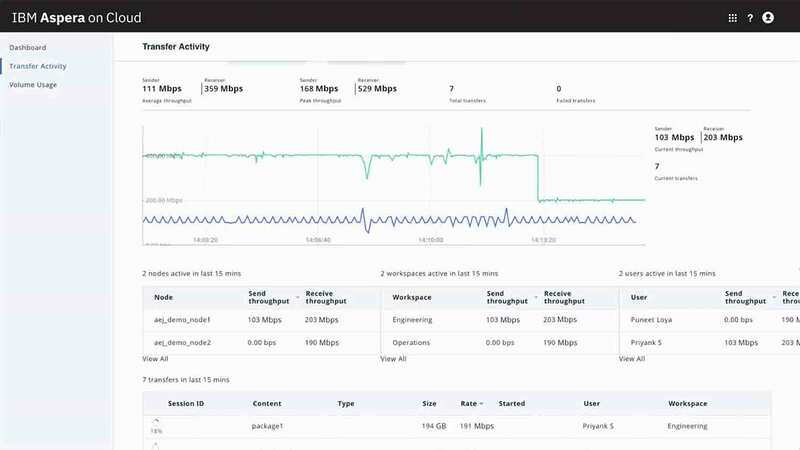 Connect to all your cloud and on-premises storage and remotely manage your transfer nodes with a single easy-to-use interface. Store and readily access files and folders in multiple cloud-based and on-premises storage systems. 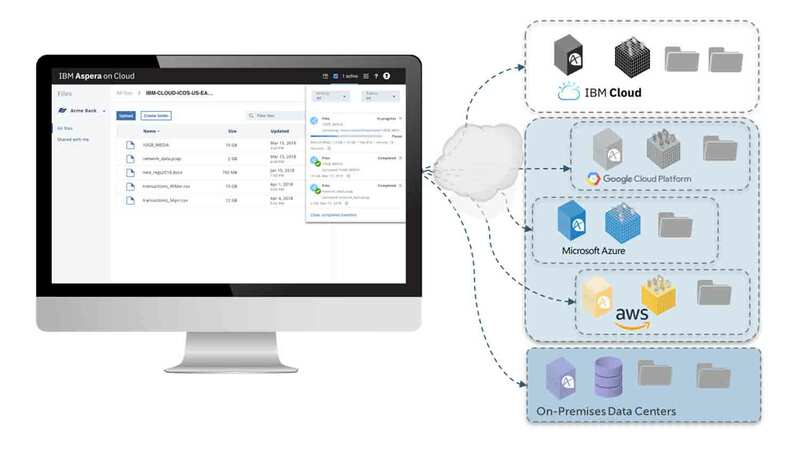 Configure access to transfer nodes located in your data center or on any of the following market-leading cloud platforms: IBM Cloud™, Amazon Web Services (AWS), Azure and Google. Establish network policies that govern how transfer nodes interact with each other. Monitor transfer activities in real time, while embedding your brand into every communication and web asset. Manage transfer activities, storage usage and digital packages in real time. Monitor activity logs and service alerts. Manage membership in workspaces, user groups and shared inboxes. Easily create a uniquely branded web presence by customizing email templates and logos to match your brand identity. 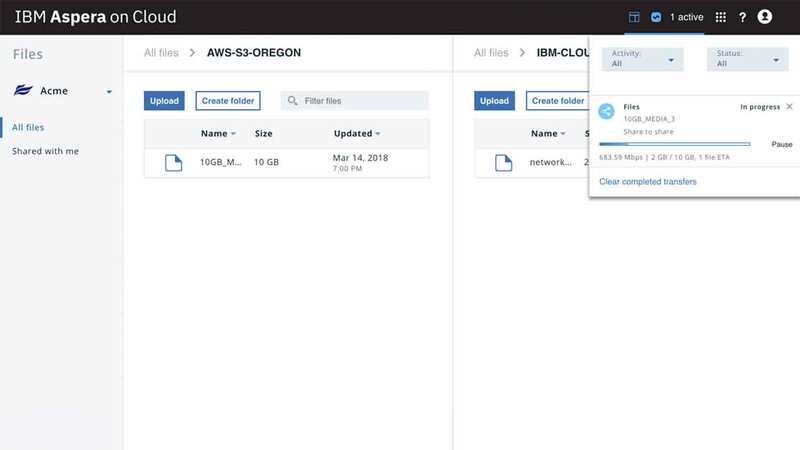 Built on the patented IBM Aspera FASP® technology, Aspera on Cloud can move data up to hundreds of times faster than FTP and HTTP, regardless of file size, transfer distance or network conditions. Fully utilize your available bandwidth, without impacting other traffic on the network. 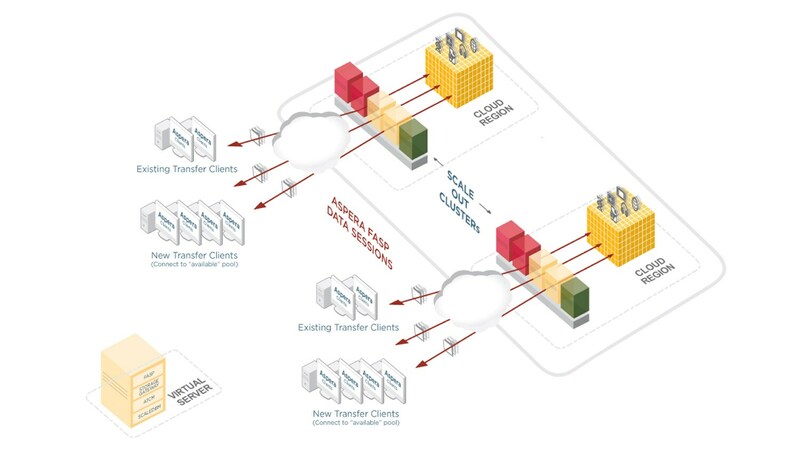 With direct-to-cloud technology and built-in clustering, Aspera can provide faster performance and automatically scale transfer capacity. Enterprise-grade security includes a powerful access control model, encryption in transit and at rest, and data-integrity verification. Transfer, exchange and deliver your data across public, private and hybrid clouds at maximum speed.